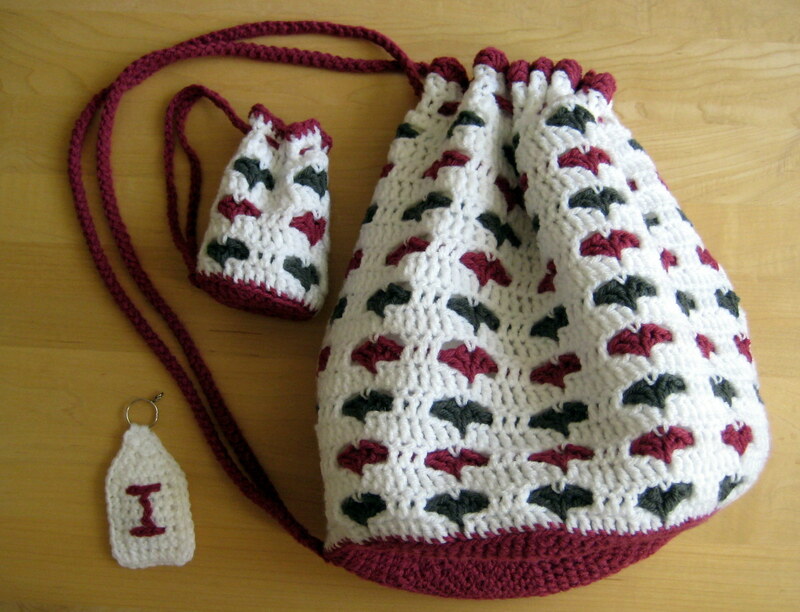 What do you think of these cute heart bags? 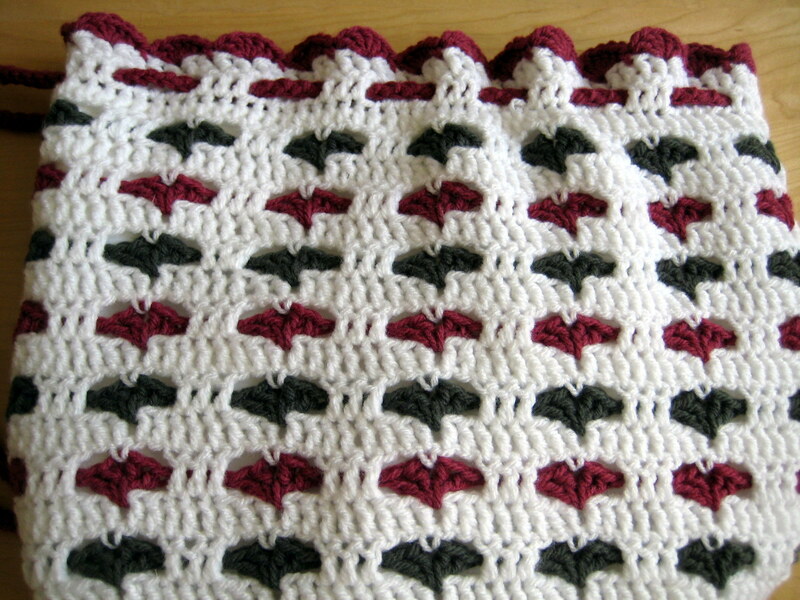 You may recognise this heart stitch pattern from this lovely blanket pattern which has been popping up everywhere I look recently. I thought it was pretty so I wanted to give it a try. I liked how it worked but thought it would work much better on an item where the ugly reverse side didn’t show. Also, the edges look a bit unfinished because of having to do some dc’s in the coloured thread to anchor it, which I felt spoiled the pattern. So I have changed it! 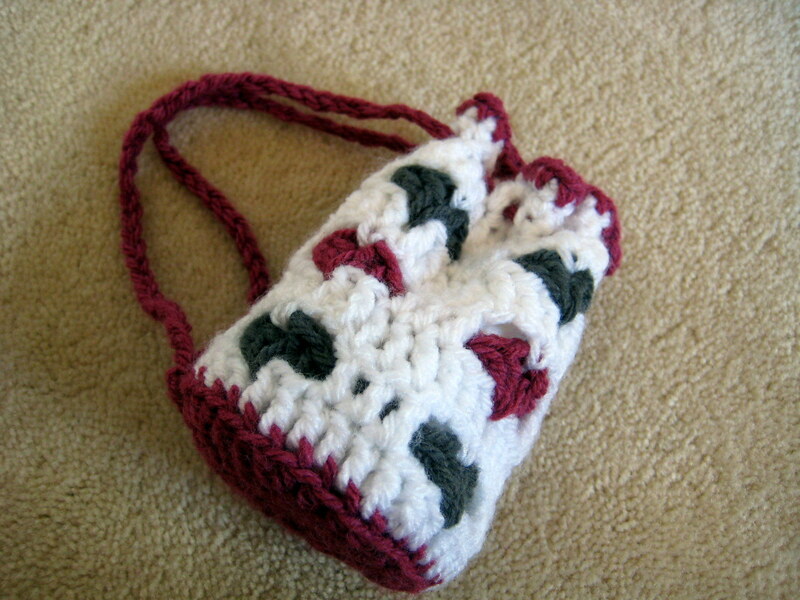 I have also made the bottom of the hearts pointier by adjusting the placement of the middle two double crochets. You can easily adjust this pattern to make your preferred size of bag. Just do more or less rounds of the base circle (keeping in the expansion pattern). You will need aran (worsted) weight yarn, I used Sirdar Supersoft. 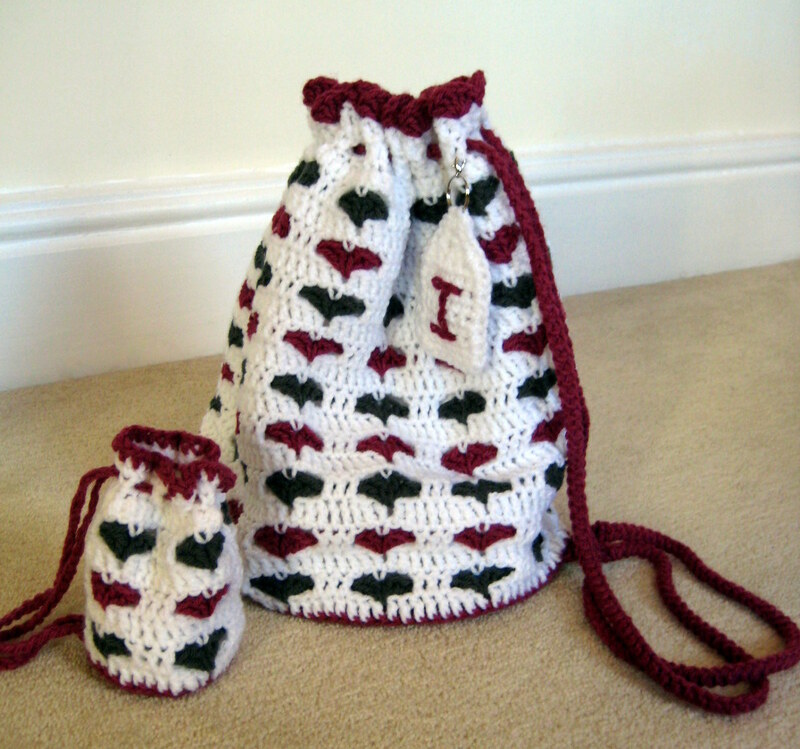 For the large bag you will need 230m white, 110m pink, and 20m grey (or use colours of your choice). You can make the small version with leftover stash! You will also need a size 5mm hook, and some lining fabric (recommended). The bag is constructed in the round from the base up. 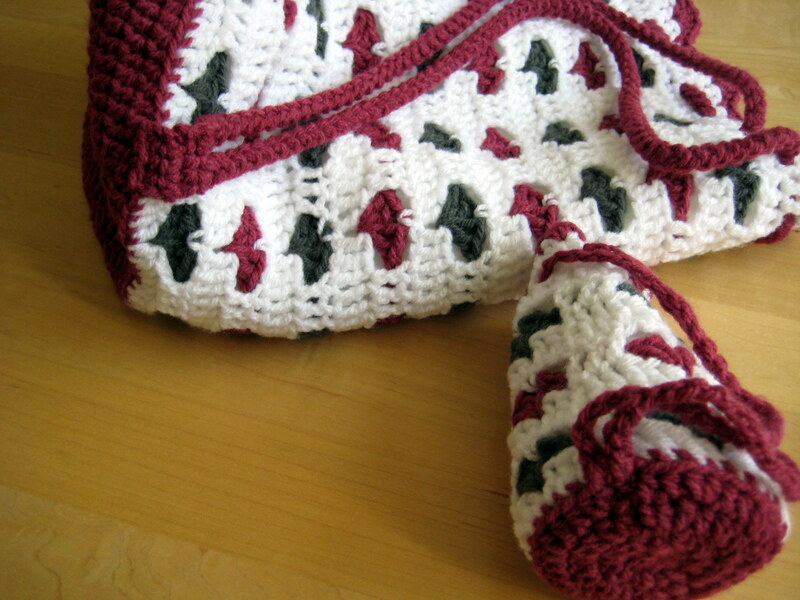 The lobster cord drawstring is made separately. In pink (or main accent colour) make a magic ring and ch 1. If you prefer a larger sized base, continue in expansion pattern. My large bag (pictured) had a base stopping at round 12. The sides are worked in the round. Row 2 adds in the hearts, and row 3 is worked in front of this row, leaving “windows” for the hearts to peak through. 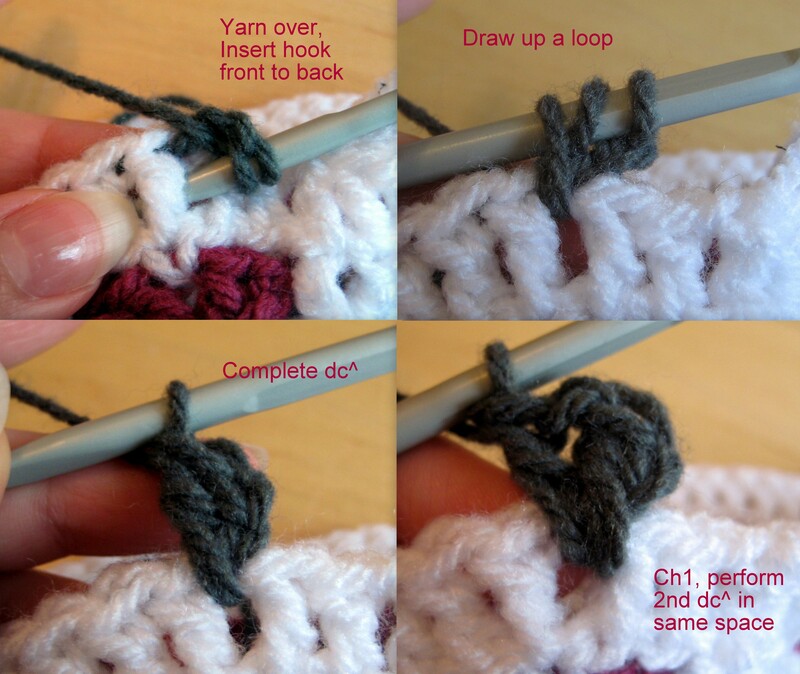 This is worked exactly the same as a double crochet, but rather than inserting the hook under the front and back loops only, the hook is inserted below the horizontal bar between the last dc post and the current one. Then yarn over and draw up a loop, completing as for a regular dc. 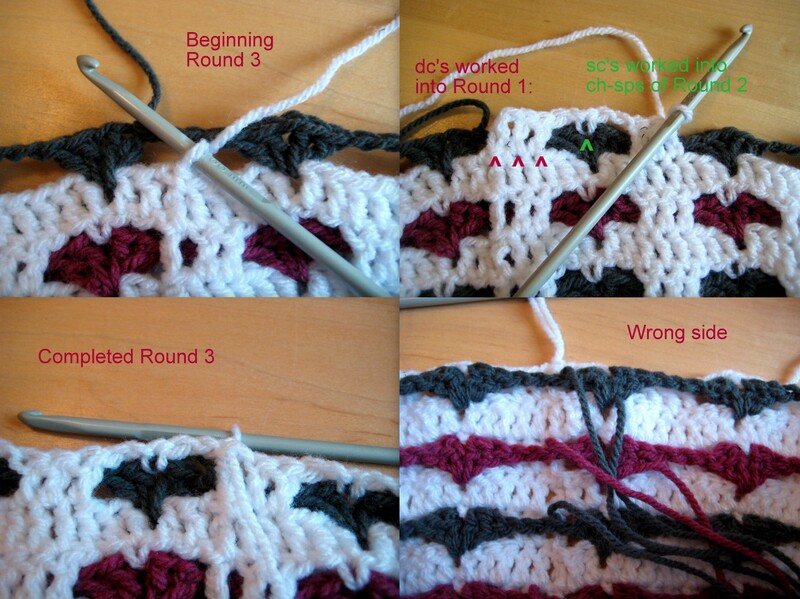 When swapping back to make the last regular dc into the same st you may need to wriggle the dc^ stitches to the right! 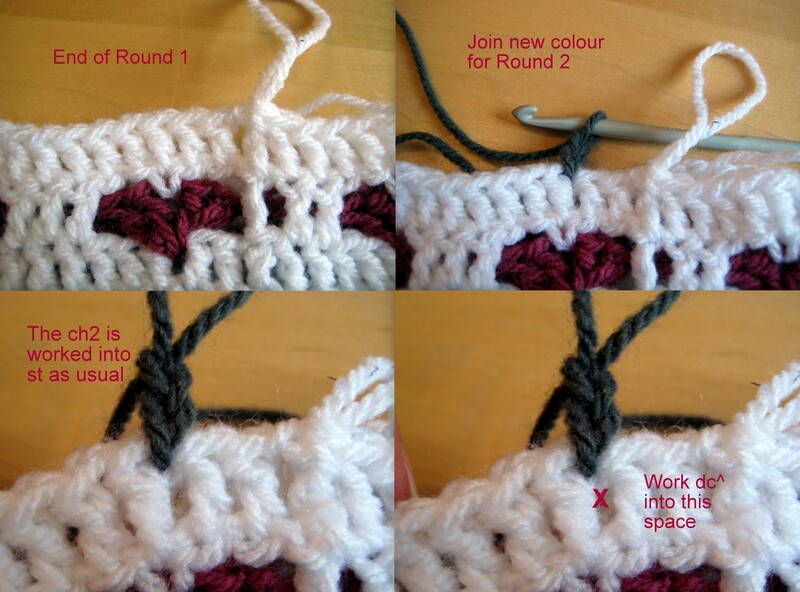 R2: Continuing to work in the same direction, sk 2 sts and join grey (coloured) yarn. *(Ch2, dc, dc^, ch1, dc^, dc) into the same st, ch3, sk 7 sts, repeat from * to end, join with a sl-st into top of ch2, fasten off. Insert hook back into the large loop of the main colour (from round 1) and draw tight. Work in front of R2, and work the dc’s into row 1 and the sc’s into row 2. R3: Ch3 (counts as a dc), turn, 2dc, ch2, sc into ch-sp (between the dc^’s of the coloured row), ch2, *3dc, ch2, sc into ch-sp (between the dc^’s of the coloured row), ch2, repeat from * to end, join with a sl-st.
Repeat rows 1-3 (changing the colour of row 2) until your sides are the desired height (approx. 9 repetitions for large bag). Join the colour used for the base into any st.
R4: ch1 (counts as sc), sk1 st, (5dc), sk1 st, sc, repeat from * around and join into first ch with a sl-st.
For larger bags, make a lobster cord in the colour of your choice. If you want to attach this at the base of the bag, as I did, make it twice the height and width of the bag. My tutorial on making a lobster cord can be found here. Once you have made the desired length, do not fasten off. Thread the cord through the eyelets of the bag. Finish the cord by making a sl-st into the next “st” (two side loops) of the cord and ch 1. Now work 2 sc’s across this end of the cord and the remaining end of the cord to join them together (4sts). Ch1, turn, and make another couple of rows of sc. Now ch1 and sc through both the cord sts and the unworked back loops of the base to attach the cords (makes 4 sts). Fasten off with a long tail and stitch over the sc’s just made to ensure they are secure, before weaving in the ends. If you do not wish to join your cord ends to the base just finish the cord with a sl-st (as described above), thread the cord through and tie a knot in the ends. For smaller bags, make a chain instead of a lobster cord and thread through the eyelets. Either knot together or sew the ends into the base. I recommend blocking this piece to make the surface of the fabric lay flat. I steam blocked mine using and iron held over the bags. I also recommend lining the bags with a fabric matching your main colour (white in my case). This adds strength and body to the bags. To make a lining, cut a circle for the base (plus seam allowance) and a rectangle the height and width of the bag. Pin and sew together, and hem the top. I like this tutorial for how to sew in a lining. Very cute bags. Great for storing all your little bits and pieces. This is beautiful. I cannot wait to make these for my daughters and granddaughter. Thank you for sharing. Cute bag! Thank you very much!